252: Archival week at the Blue Nickel…. Well, It is fall clean up here around the Blue Nickel, and I am going to clean up as much as I can around here before the holidays hit….I might even get to the stack of holiday newsletters and “addendums” that I have been negligent on since 2008…. but that is another story entirely. The next few posts will be a group of old ones that have been sitting on the dashboard of the blog or in file on the laptop gathering dust. This post was started with my series of Market posts, and apparently got left behind in the dust (or after THIS summer, mud would be a more apt description). 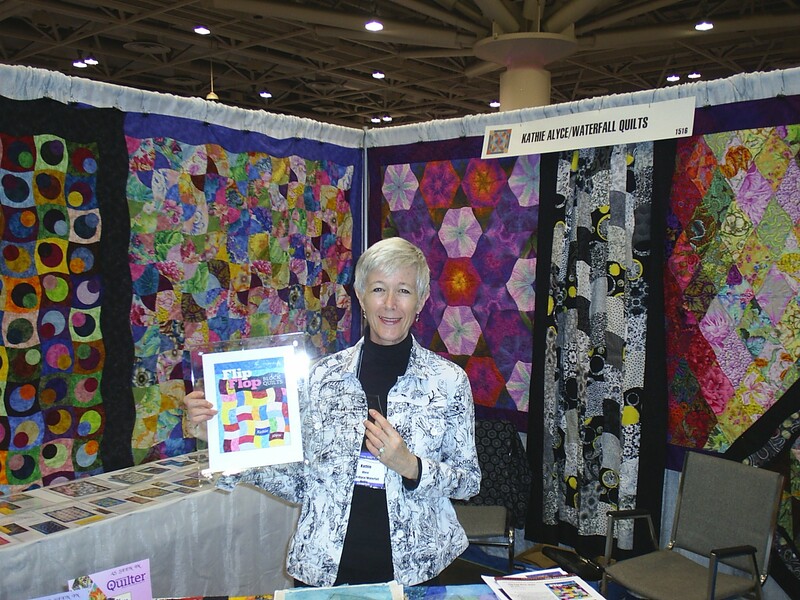 Here we have some photos and prizes from this past May from Quilt Market. These photos are from Kathie Alyce’s booth at Market. Kathie is just the sweetest lady and has this really great set up for sewing curved pieces, with a variety of applications. Here are a just a few pictures, but please pay Kathie a visit and say hi from me. And the last two prizes from my Quilt Market Trip…..a cute pattern from Carla (whom I didn’t get any pictures of) who does patterns with Jennifer often…and a wonderful prize pack from Connie… whom I took NO pictures of either ….mainly because I so enjoyed her company at Market….we met at BariJ’s hotel waiting in an INCREDIBLY long line for the elevator and really hit it off. 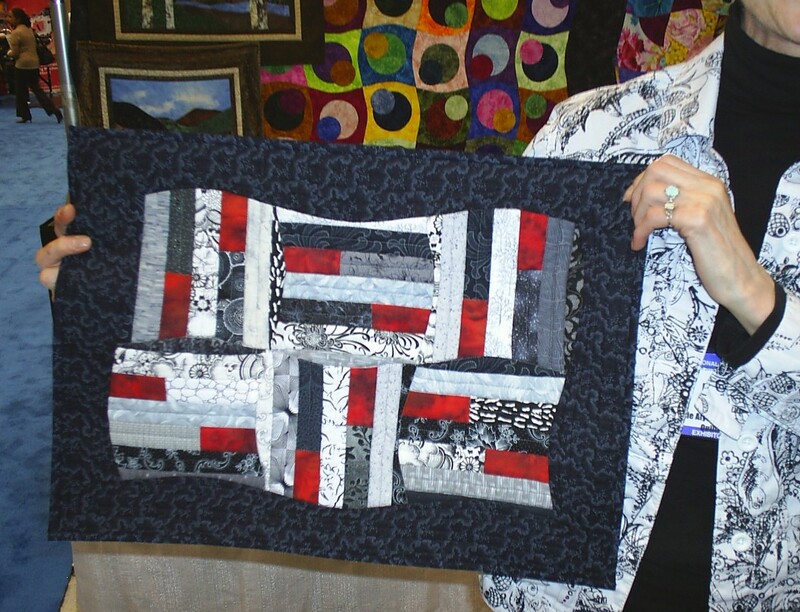 When I stopped by her booth the next day, I totally forgot to get any pictures of her….but she does the most wonderful things with fibers. Check out both Carla’s and Connie’s websites! They are both terrific ladies. Oh, and check out BariJ’s site as well!! To win this combined prize pack, just leave a message about your summer autumn plans and dreams…..Looking forward to hearing from you. I will draw randomly on October 14th. I had this post already to go, and then I looked for the prize pack in my studio, and started to panic, because I couldn’t find it….but I did eventually, so here we go….comment away! AND don’t forget, There is a giveaway going on the last post too! Be sure to read that post and follow the directions for that giveaway as well. Both prizes will be drawn for next week. Hey Scott, it’s autumn right now and I plan to take one last tour around the lake on the pontoon looking for fall colors and then fly off the Florida tomorrow to hang out with my sister for a few days! What are your autumn plans? My autumn plans? hmm…well the day job really starts taking a lot out of me this time of year, so a lot of work is in store for me. But I also hope to sew and write up a whole lot of these ideas that have been popping in my head lately. But we might get away to some antique shops and such, if we are lucky! Funny you should ask….I spent a few minutes yesterday counting projects I want finished before the holiday, and the days I have left to accomplish it. 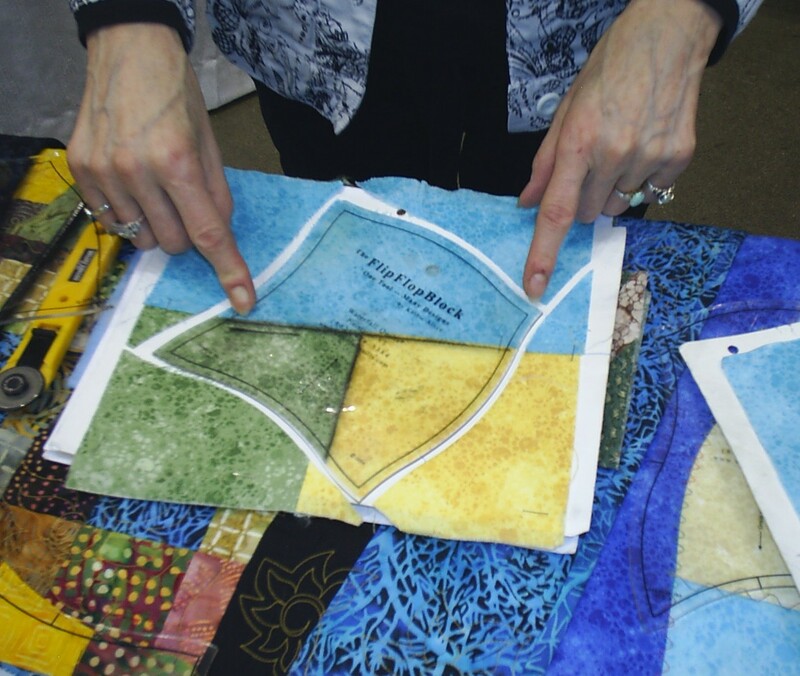 Sew-ins, quilt retreats and long hours slaving in my studio. Torture, really. Please count me in for your giveaway. I like your blog! i’m planning to make christmas presents for friends and family. maybe a lot of hats. Thank you for another giveaway! I don’t have any big autumn plans – I’m job hunting right now … we did go to Portland for the Northwest Quilting Expo a couple of weeks ago. It was great and there is always lots to explore in Portland. This weekend is Canadian Thanksgiving, so we’ll be having the big dinner with the family … Have a great day! Hi there! Thanks for doing this giveaway! 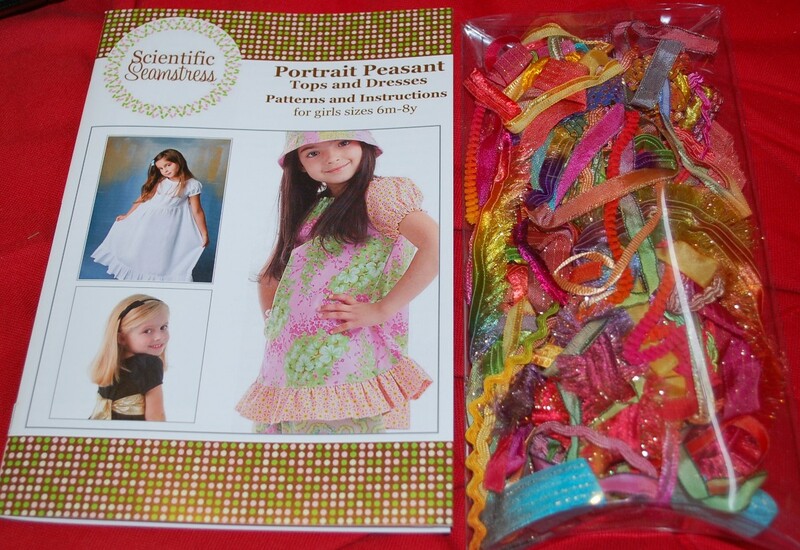 I love Carla C’s patterns and the fibers look yummy! My fall plans are to clean out my flower beds, trim some rose bushes, and plant my pansies. I can’t wait to get to my pansies!! Love flowers! But, I’ll have to wait for some rain, it’s been way to dry here. I’ll be trying to survive autumn. I do get to go to Quilt Market for the first time. I’m not doing any handmade holiday gifts unless I make things for my kids. I’m hoping that will make for a less stressful fall. 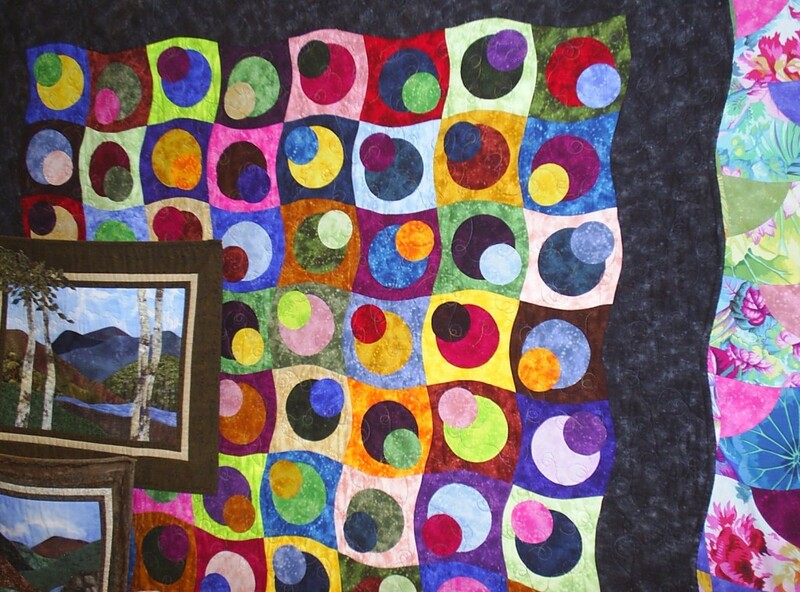 I love quilts with curves, by the way, although I haven’t been brave enough to make one yet. We are on the downside of autumn here in northern Maine. Gotta get my flower beds cut down esp around the autumn joy sedum. I love all the bees that are so chilled in the mornings you can actually ‘pet’ them. The sedum is covered with bees! 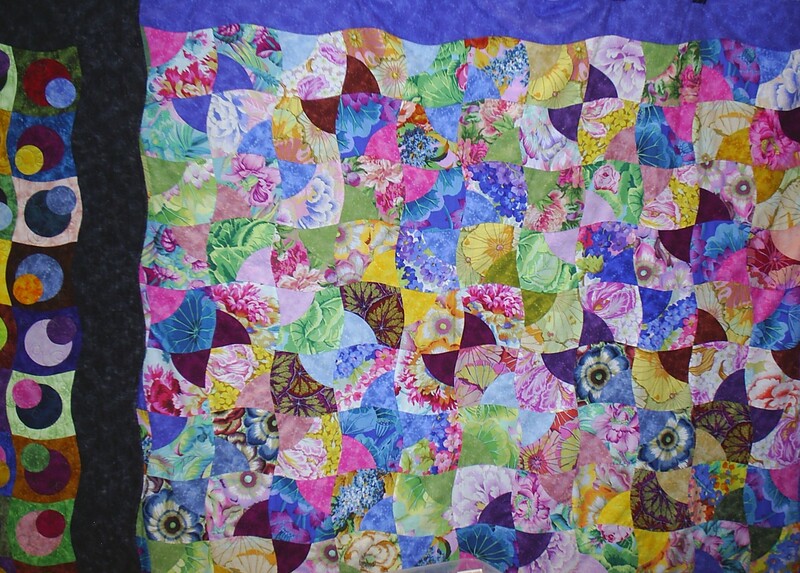 I’ve got a baby quilt to finish the quilting on…grandbaby #10 is 2 weeks old today. I’d like to make a few runners as gifts for my married kids this year..but I often think about gift making and rarely ‘get her done’! Planning to spend Thanksgiving away from home for the first time in my married life! Going to see the oldest and his kids down state. College siblings are not happy about not coming home, but hey, things sometimes have to change. It won’t happen every year…I love to entertain too much to give up that pleasure. Here in the French countryside we are grabbing apples, pears prunes walnuts….. Weather is so beautiful. Next tuesday we go to the applejuice maker. Some weeks ago we were there and we came home with 69 liters of pasturisised apple juice. The smell when the juice maker is working……..so delicious. My autumn plans will be to visit family in New England and see the wonderful fall colors. Haven’t been there for a few years so it will be great. Thanks for hosting the giveaway. Well, a couple of my friends helped me empty out the last of the things I had in storage with my move and all of that stuff ended up here with me – ugggghhh! I set a goal to have everything sorted and cleared away, i.e. give away, yard sale, keep, etc. so I can have my studio (and the rest of the place) back in order for Thanksgiving. I am planning on moving to a new house in a new town in the next month or so. I am so excited to decorate a new place! What to do this Autumn…..
1) Enjoy my kids and love them for all they are worth. 3) Watching more of the new seasons of Dr. Who with my newly found tween geek-who finally GETS the humor. 4) Watching the leaves turn along the bosque. 5) Smootch my hub because he is my best friend in the world! Hope your Autumn is beautiful Scott!! Can’t wait to see what you will come up with next! Here in Australia we’re just enjoying the beginnings of spring…waking up to bright sunshine, birdsong and the sound of waves crashing on the beach…watching beautiful big hippeastrums bloom, surrounded by shy strawberry plants hiding their crimson treasures and beautiful new red leaves on the camellias…planning relaxing barbeques with good friends, good food and a glass of red…and of course finishing off UFOs and shaking out the cheery spring fabrics to start planning new quilting projects! I think I need a ruler like that. 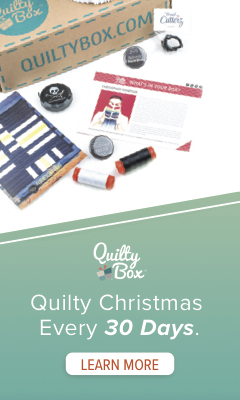 My plans for autumn are: Quilt market then ready for Christmas. It will be here long before I know it. Autumn plans are a little scarce for me. I’m about to start another round of therapy which will take me up to year end. I’ve also got a mountain of projects both stitching and quilting to finish before the avalanche of UFO’s kills me. I’ve also got to make some decent curtains for my ill-fitting doors to keep the heat in this winter. And finally I need to think long and hard about presents for Xmas for those amongst family who celebrate. That’s about it really. My first priority is to dig out all of the UFOs I have stashed away and do a complete inventory. I have promised myself, I will complete at least 2 of them before Christmas. My husband and I will also be taking a 2 week driving trip down to Fla from NY and it will be our first time visiting Disneyworld without our children (22 and 25). I also plan to make a quilt from Pam and Nicky Lintott’s “Two From One Jelly Roll Quilts.” I love this book and the fact that each of the patterns uses half of a jelly roll to make one small quilt. I forgot to mention that I love the thread spools on your blog page. When I was young, Belding Corticelli was only sold in finer fabric shops and I used it to sew my wedding dress thirty eight years ago. what a cool little story about those threads! !…I inherited them somewhere along the way…I just love old spools just for their built-in heritage…. autumn plans … a long list! sewing & more sewing! playing with some new designs … a giveaway on my blog soon, organizing my stash….and the list goes on! Guess I’ve never thought about making Autumn plans. But I do want to get some UFO’s finished and get my sewing pit, I mean room, organized! It’s been a mess since we moved 2 years ago. Guess I shouldn’t really complain, cos my DH actually did all the moving while I was taking care of my sick father. But back to Autumn plans, UFO’s, Cleaning, raking leaves, making s’mores, seeing family and just relaxing before the snow flies.